Back again—and in top form—are LAPD Homicide Lieutenant Peter Decker and his wife Rina Lazarus (Jupiter’s Bones, 1999, etc.) for their 13th praiseworthy attempt to cope with a world they never made. This time the trouble starts when a vandal defaces Rina’s storefront synagogue with spray-painted swastikas and other testaments to hate-mongering. Rina is shattered, Peter enraged. Though it doesn’t take long to catch the culprit, at first glance Ernesto Golding seems not to fit the profile. He’s bright, a good student, even charming. He’s also half-Jewish. But, as events prove, Ernesto is an extremely disturbed young man, mixed up in a variety of extracurricular activities, all of them either sexually or socially destructive. To stay out of jail, Ernesto agrees to seek help from the doctors Baldwin, a husband and wife team of therapists. This shady pair prescribes survivalist training for Ernesto, at a camp run oh-so-profitably by the Baldwins themselves. It turns out to be extremely bad medicine, however, for the therapists as well as Ernesto. All three are gruesomely murdered. A dangerously deranged person, Decker decides, is acting out some sort of complex fantasy, but who, and what sort? “Every time we get a suspect,” he laments, “he winds up dead.” Meanwhile, the Decker household continues its unflagging soap-opera run. Orthodox Jew Rina and secular Jew Decker remain the at-odds couple on most available domestic fronts, while agreeing always that they love each other irrevocably. 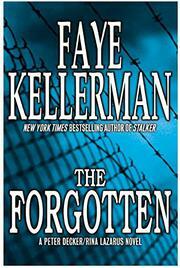 Warm, funny, fast-moving, even decently written: Kellerman at her unassuming best.